In the not-so-distant future, 5G technology could be a major disruptor and one such opportunity to take advantage of this is the 5G ETF (FIVG) from Defiance ETFs. Investors who missed out on the serendipitous run of FAANG (Facebook, Amazon, Apple, Netflix, Google) stocks can look to capitalize on disruptive tech options in 2019 like 5G technology. 5G technology will use a higher frequency band versus the current 4G technology standard, resulting in faster transmission of data. Being able to transmit copious amounts of data at a faster rate is certainly of benefit for wireless companies and their users, but 5G could be a major disruptor in various industries. Other possible plays include leveraged ETFs like the Direxion Daily Communication Services Index Bull 3X Shares (NYSEARCA: TAWK) and the Direxion Daily Communication Services Index Bear 3X Shares (NYSERCA: MUTE). 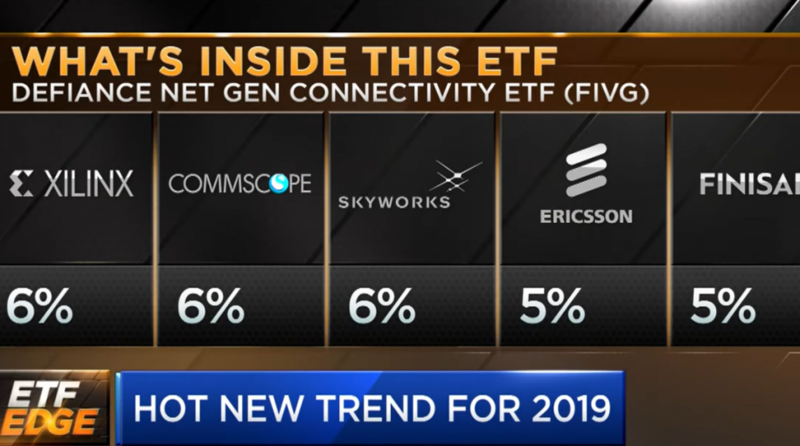 In the video below, CNBC’s Bob Pisani discusses the next hot ETF trend, 5G, with Motif CEO Hardeep Walia, John Davi of Astoria Portfolio Advisors and Deutsche Bank Head of ETF Sales Chris Hempstead.